Information is critical to the operation and maybe even the survival of any organization. Being certified to ISO/IEC 27001 will help you to manage and protect your valuable information assets. ISO/IEC 27001 is the only auditable international standard which defines the requirements for an Information Security Management System (ISMS). The standard is designed to ensure the selection of adequate and proportionate security controls. 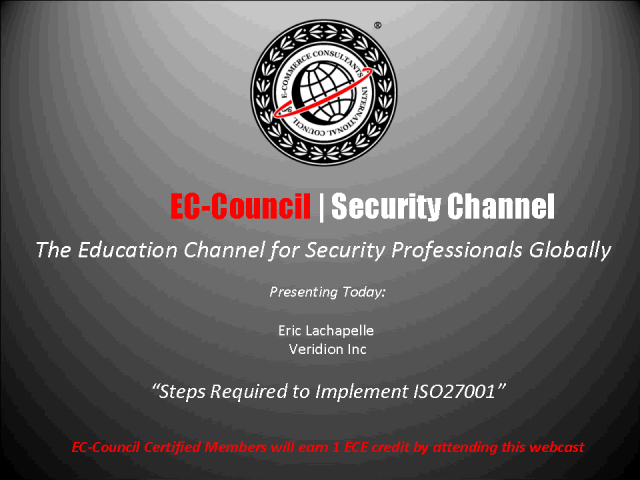 This session will see Eric give an introduction of the ISO27001 standard, and the steps towards implementing it. Eric Lachapelle, CEO | Veridion Inc. Presented by: Eric Lachapelle, CEO | Veridion Inc.